It gets 4 smilies and 1 unhappy face for the cost. You must have bought your jacket at Vespa Seattle, in which case I was there yesterday too! I went and bought the (women's) 5.0 jacket during lunch hour Friday, but when I got back to work realized it was missing the right shoulder armor. Went back yesterday after MSF class (around 4:30-5) and got the other piece. Wonder if you were there around the same time? I feel like they slightly look down on Buddies, even if they don't outwardly say it. I mentioned that part of the reason I like my Buddy is its shorter stature, and the sales guy said something like "yeah, that's one benefit to them..." Don't think he was trying to be condescending, but it was just a bit. Do the men's have pit zips? I just got a women's jacket and I was sad that it didn't have any pit zips. No pit zips. but it has two zips on each shoulder blade. Yes the men's has pit zips. Quite large one's actually. I personally like the large collar as it helps control the wind going down your jacket. The velcro on it tends to grab my chin strap a bit though. huh?? Mine has both. Was there a change recently? I bought mine 2 weeks ago. my 5.0 doesn't. bought it last summer. It has a very light breathable fabric (lycra??) running up the sides and under the arms. It has two zippers for vents but they are on the back. Interesting, so they have made a change. Mine has a small, 6 inches, zipper on the shoulder blade and a longer, 10 inch, zipper for the pits. I can post a photo if anyone is interested. It might be a good idea to keep a visual record of this jacket as it seems to prompt a lot of questions and interest. Thanks for the time to do such an informative review. Last weekend my ADHD sweet husband put his Speedrag Falcon jacket on the back of his sissy bar, and while I was situating my stuff I saw some smoke coming from the other side of his bike. Yep, he slung the arm into the tailpipe and melted a nice sized hole in the arm. We were sick about it because it was one of the only non-retarded looking jackets he could find a couple of years ago. The very cool-looking James' Dean type jacket was injured! So after we got back home I began googling like mad to see if we could replace it. Nope. The company is out of business, so we came up with the idea of looking for scooter jackets since they are infinitely cooler than motorcycle stuff. I found Corazzo before I wandered into the forum, and since I showed him the website he has been drooling over the Speedway or the 5.0. We actually went over and looked in the windows of the scooter shop where we bought Buddina today and saw the red 5.0 hanging. Waaaaaaaay cooler looking in person than online. He wasn't considering the red 5.0 until we saw it today, and now I think he is leaning away from the Speedway, which was his first choice when we saw them online. Now if I can figure out why he gets a cool $225 scooter jacket to wear on his motorcycle while I have ghetto Joe Rocket jacket we found at a motorcycle store. . .
My wife and I both have 5.0's. And hers even matches her scooter color. The 5.0 is actually very comfortable too. I've even found it to be very cool in the warmer weather. It's definitely not a winter jacket. I would like to add that Corazzo and Vespa Seattle are awesome... I went back in ready for a battle to get the back armor that was forgotten... They said "Oh no problem!" and put in the back armor, I guess with how busy Corazzo has been lately this has been happening occasionally, but they are really good about replacing it, or should i say placing it? after the purchase. Nice review! I moved it to the Reviews forum and left a shadow in the General Discussion area. 2008 Tangerine Buddy - "Tony"
Couple questions - have you ridden this jacket in the rain? How wet did you get? Also - how is the sizing/fit for you? I tried one on at VespaSeattle and needed an XL, which was perfect in some places and baggy in others. I really like the look of those, and they look more "scooter" than "motorcycle". I am also curious about the rain thing. But also curious how it fairs in 100f sunny weather. Oklahoma can get pretty darn hot. And while I would rather be hot and be protected, I'd rather not pass out being smothered by the jacket. Can you take some detailed pictures too so we can see the vents and collar and such? At 100 degrees, you need a mesh jacket. I wear the Max most of the year�in Los Angeles. But I've ridden with it in 45 degree weather, with layers underneath. The Max is intended to be fairly breathable, so it's not super wind-resistant. For me, it's comfortable in the 50-85 degree range. You could probably do colder with smarter layering. 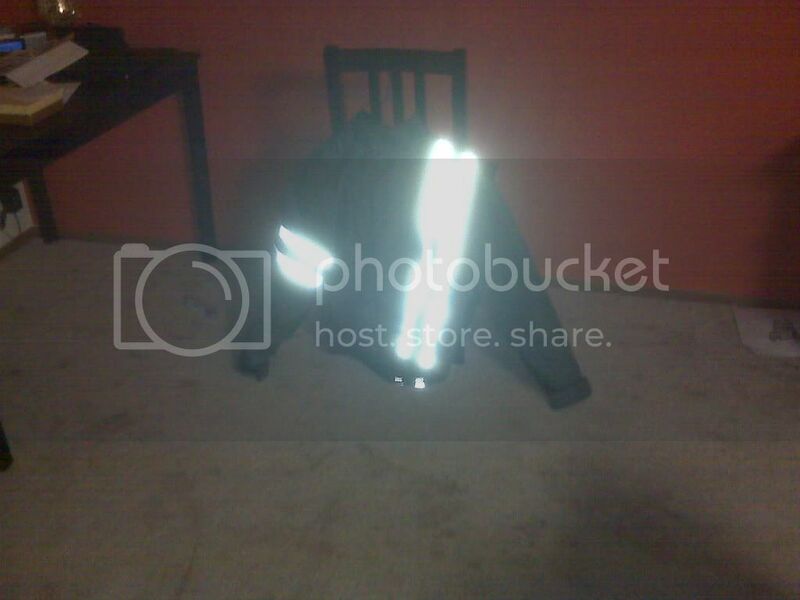 Here is a picture of the reflective capabilities of the jacket. Very reflective, I like that about it for sure. I need to find a local dealer and go try them on to see if I like the fit. Hi from Germay. Since a few of months i am thinking about buying a Corazzo 5.0. Unfortunately they're not available here in Germany. I am 1.87m (about 6' 3"), weight: 80kg (about 175 lbs). Is there anybody who could give me an advice concerning the size? L or XL? Does anybody know, where I can order it? ...or ...hmmm. Could anybody imagine to get one for me and send it to me? Payment via Paypal would be absolutly secure I think. Contact Corrazo directly. They were very helpful with me when I bought my 5.0 before Nashville had a dealer. I paid them directly with my credit card and they sent it to my door. Yes, call them directly. The guy who's been helping me was friendly and shot the breeze with me very honestly and openly about whatver, gave me sizing info, etc. Frustrating you cannot just by it here in Germany. My 5.0 jacket (Black w/ Red stripe) just showed up as well as the Carbone vented gloves. I own a lot of gear for a lot of activities (motocross, snowboarding, triathlon....), and this is some of the best made stuff I've ever run across. Definitely worth the money, this gear will last for YEARS! Have been wearing my 5.0 for the past 700 miles and love it. On last night's ride, it went from 90 degrees inland to 60 degrees and foggy at the beach. Only wearing one layer underneath, I was sweating while gassing up but cooled off with all the zippers open when I started moving. And I was relatively warm after zipping everything up when I got to the coast. Fabric has softened as I've worn it and could probably function as a regular jacket if I took out all the armor. I've also been able to jam it into my pet carrier and top case and not have it wrinkle or have the armor move around. I haven't experienced the floating armor issue. I've recently discovered the nifty little inside pocket that works perfectly for holding an iPod or cell phone. My only pet peeve is that the velcro seam on the inside of the collar, when the two sides come together, seems to catch on my throat if I don't adjust the collar perfectly. That is a very minor irritation and I would still buy another if I had to replace it. I would like to see how fellow owners use the chest pocket. I'm only using it as an extra vent at this time. Some weeks ago I've received my 5.0 via a shop in GB... Finally. My first impression was ok.... The material seems to be ok; it fits very well. I am a little disappointed about some details. The lining /(just thin mesh) is very poor, it does not hold the protectors in their position. Zippers: Normally motorbike-jackets do have fabric also 'under' the zippers. I never would buy it again... However it looks nice. Posted: Wed Feb 25, 2009 5:45 am Post subject: Looks good from the front. For now. 1) Fit: I fell smack between the medium and large sizes on the website's sizing chart. I considered getting the medium, thinking that a smaller jacket would prevent puffiness, but decided (after speaking to the helpful staff) to "grow into" the large. Au contraire, mon frere. After trying this on, it's clear that the sizing chart describes the outer limits of the jacket, not the median measure. The large fits comfortably, but snugly, around my 34" waist. I'm 6'2 and lanky with 35" (that's shirt length, not gun size) arms. The sleeves of this jacket are a tad short; it pulls just a bit at extension. Not only was this unexpected considering the position in which this jacket is made to be worn, but it makes for chilly February wrists right now. Shoulders, neck, and chest fit fine, and the extra jacket on the tailbone is a nice touch. Shoulder armor does seem to float around a little bit... I had to rearrange on my test ride. Finally, does anyone else have an issue with the puffy area where the armpit meets the back? I mean, the Women's jackets get spandex on the sides to give a better fit. Why not on the Men's? I think a little spandex in judicious areas could do wonders for the jacket and accomodate those (like myself) who plan to grow involuntarily outward from the middle in the future. 2) Color: I reluctantly bought the blue 5.0. From the photo online, I thought I ran the risk of looking like a really huge Florida Gator fan in the bright tint of blue (like, Microsoft Windows blue) on my orange Buddy. Now I like the Gators, but fortunately, the jacket is much darker in person. As a side note, the woman I talked to at Corazzo said they were working to update the website to provide better representations of the true colors. 4) Whoa nelly: $17 in shipping and handling on a $230 jacket. Really? My student loans only go so far, you know what I mean? So, this has probably seemed a little more critical than I mean to make it. I do like this jacket and fell in love with the bright-like-1000-miniature-suns reflective striping design. I would only suggest trying this on at a dealer, among other comparable jackets, to determine which one fits best. Internet buyer beware. Posted: Wed Feb 25, 2009 7:16 am Post subject: Re: Looks good from the front. For now. It's hard to find (or even make) a true all-weather jacket. I have the Max, but think the 5.0 might be better for cold weather because its shape and length is more conducive to layering. That seems to be what many 5.0 owners do. The 5.0 is also sturdier and offers better protection than the Max. As far as the Armadillo parkas go, save your money. The shell is flimsy, the armor unproven, and there are a lot of reports that the quality and construction are poor. Good advice for buying any gear online. I've read reports from several online buyers who've said that Corazzo is really good about returns and exchanges. If not too late, you might want to see if they'd swap for another size. It's about on a par with many similar jackets form motorcycle companies. All those jackets are frequently discounted, on clearance, close out, etc. That's pretty uncommon for Corazzo because they're a small company which doesn't deal in those quantities and they don't revamp their entire line every year. Welp, I've put around 500 miles on the jacket over the past couple months, and I have to say, my attitude toward this jacket has improved. 1) The jacket is, like, totally freaking windproof to a ridiculous degree. 3) After reading Eric's reply post I started wearing a sweater. I'm much warmer now. The kinda-short arms still make for chilly wrists, but maybe I should wear longer, warmer gloves in the winter, hm? 4) Our german compadre noted there's no fabric at the wrist zips. I kinda like this because it lets me cinch the velcro way down around my wrists to keep out any wind without annoying snagging-fabric snafus. 5) In every nightime photo I take wearing the thing I look like I'm powered by some internal nuclear generator. This in turn feeds my fantasy that I'm an intergalactic superhero sent from the future. Awesome sauce. Pretty much. The pockets on this sucker are placed so that it's nigh impossible to get my hands in 'em. On the flipside, I don't worry about losing my housekeys. So far, no real problem with drifting armor. And, i saw a bike messenger wearing one the other day... made me feel totally counterculture. Worth the coin? I'm gonna go ahead and say yes.